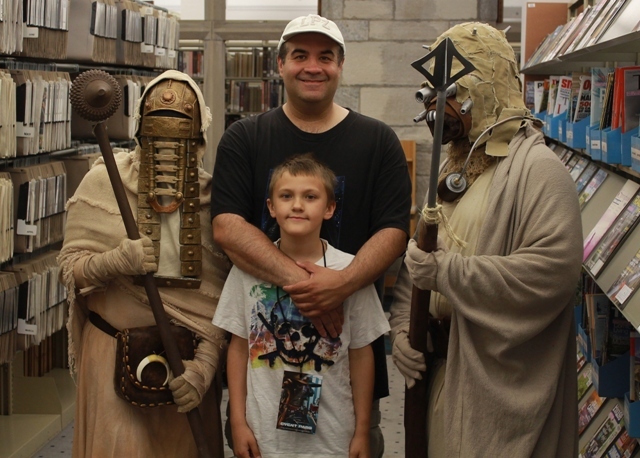 Enjoying STAR WARS DAY…without having to go far, far away! With the recent announcement that a new series of STAR WARS films are on the horizon, many of us adult fanboys have begun feeling The Force once more! Or at least that familiar tug of devotion that had been frozen in carbonite these past few years. 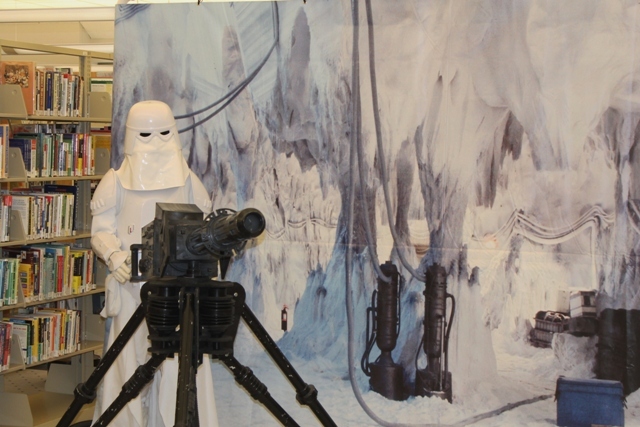 Despite the Hoth-like chill, there were a number of die-hard fans who’d been keeping the spirit alive; most notably The 501st Legion – an International group of fans who create their own movie-accurate STAR WARS costumes. 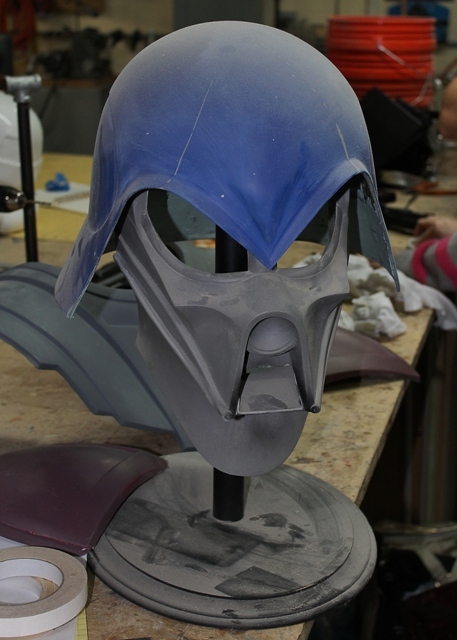 I can’t say enough great things about The 501st! 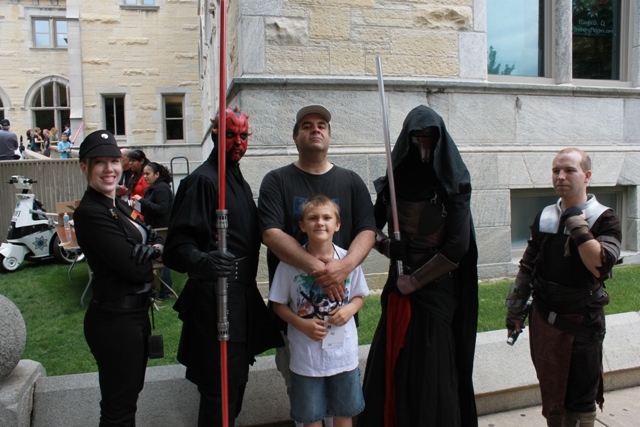 I’d attended the first three STAR WARS Celebrations (first in Colorado and the second two in Indianapolis) and their presence always made standing in those endless lines more bearable. 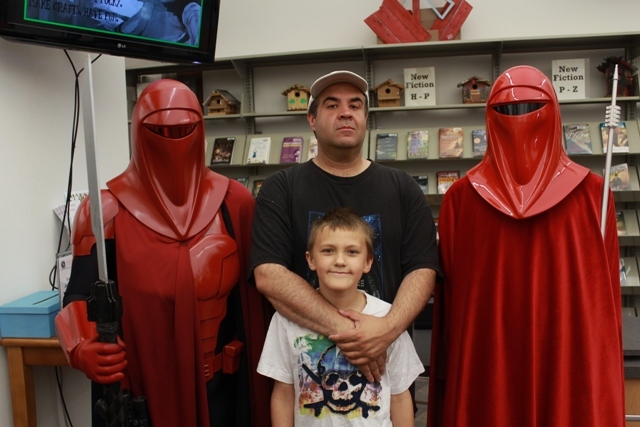 Thanks to The Joliet Public Library, I no longer need to travel out of state to “celebrate” STAR WARS. 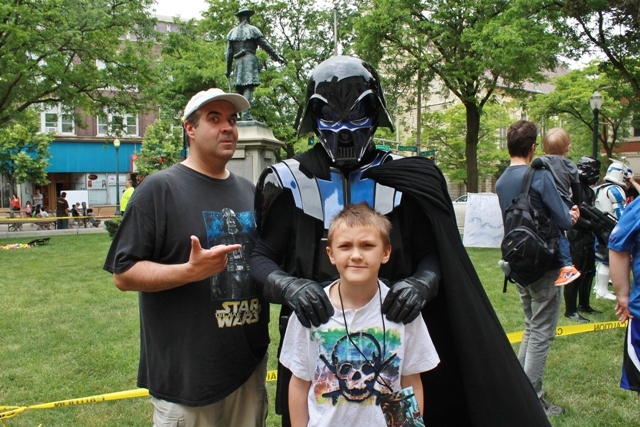 For the past few years, there’s been an event taking place right under my nose (like Palpatine strolling past The Jedi Council), with the assistance of the aforementioned 501st among others. I grabbed my sons, Alex and Luke (yes, named after that Luke…and he has a sister named Leia), and headed out at light speed (which on this planet is 55 mph). The library was barely a parsec away from The Silver Cross Field – the same venue I saw Svengoolie appear last July for that Slammers game (covered HERE as well as in Scary Monsters Magazine). 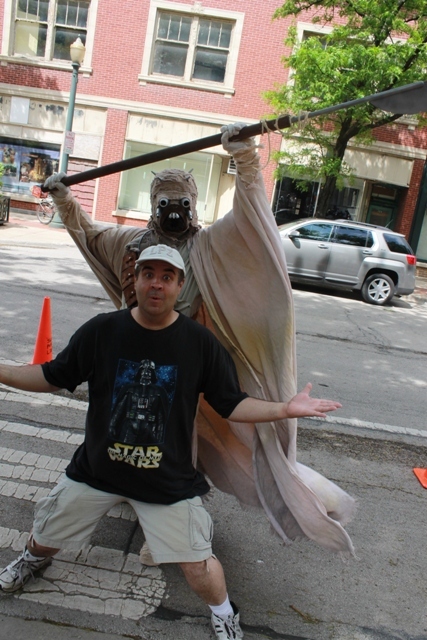 Joliet, Illinois is a full city and, like any metropolis, a tough place to find a parking spot. 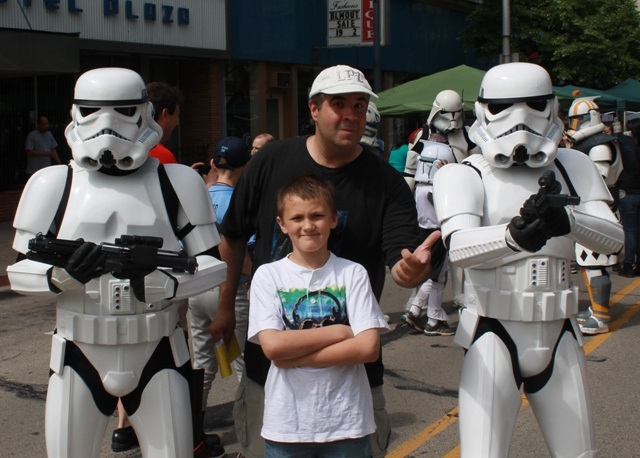 We finally “landed” a couple of blocks away but had no trouble finding our destination as there were plenty of other families (there kids dressed as Darth Vader or Clone Troopers) leading us on. Outside the library were a few vendors, many offering toys and items I currently have in storage. Our first stop was a LEGO stand which instantly garnered Luke’s attention. 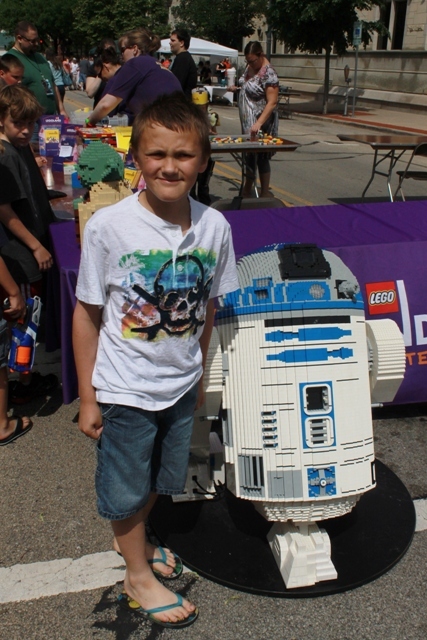 Standing next to the table was a life-size LEGO R2D2! Amid the crowds of visitors, were plenty of costumed characters to keep the cameras clicking! 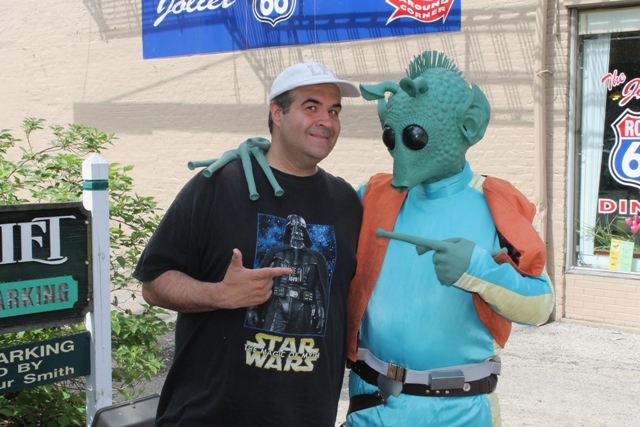 The first I encountered was a great looking Greedo! Greedo, the Rodian bounty hunter seen in the first STAR WARS film (A New Hope) has since become the center of a fan generated controversy. Without getting into details, let’s just say that in MY world Han Solo always shoots FIRST! 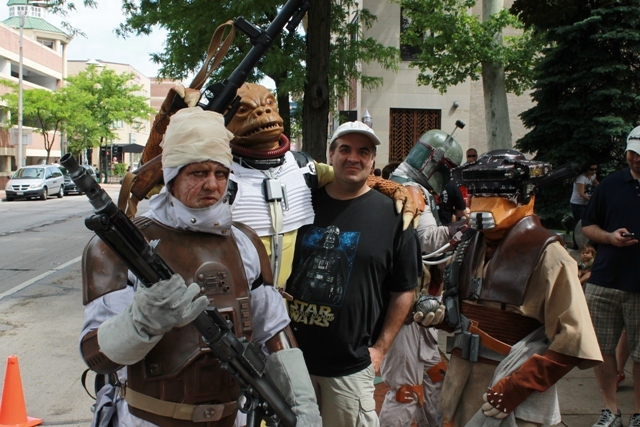 Not far from Greedo was a group of Bounty Hunters (some of which you may have noticed in my C2E2 picture series) which included Dengar, Boushh, Boba Fett, and my childhood favorite…Bossk! 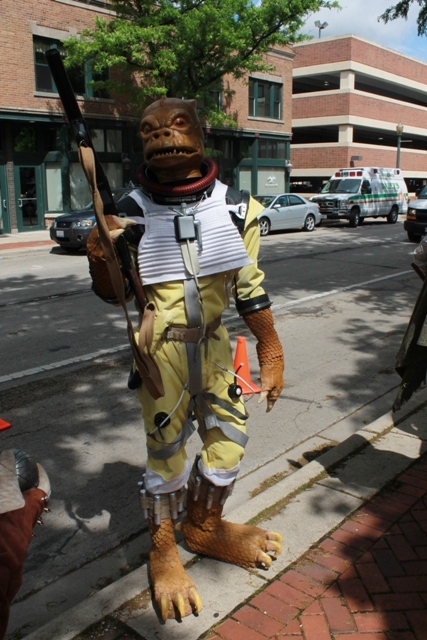 I’ve seen many a fan costume but this was the first time I saw a realistic looking Bossk and my kids about hid their heads in shame as I cheered for him! In fact, between the bounty hunters and Imperial soldiers, you didn’t need C-3PO around crunching the numbers to tell you that the bad guys out-numbered the good ones about twenty-five to one. 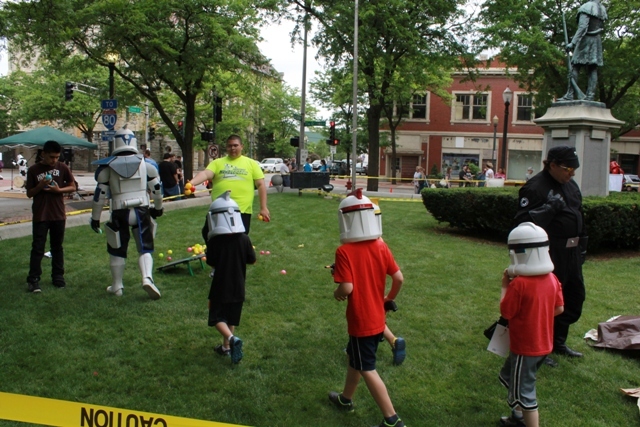 This was definitely a post Order 66 event with few Jedis in attendance! Ken Kooi in his completed costume! There were plenty of fun events for the kids who were given a special Event Pass with lanyard where they could collect stickers after each activity. 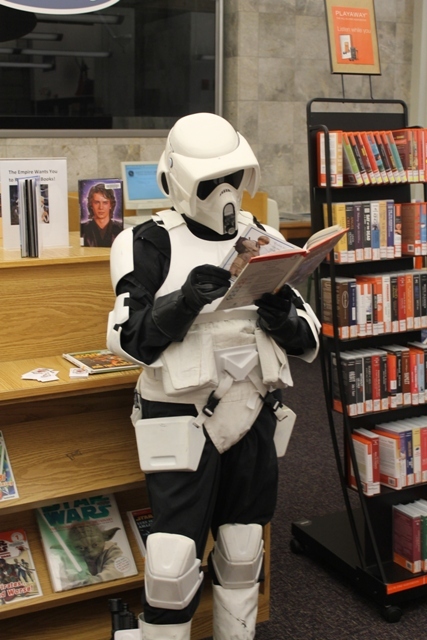 Outside hey clone trooper training while, inside the library, even more fun things to do. 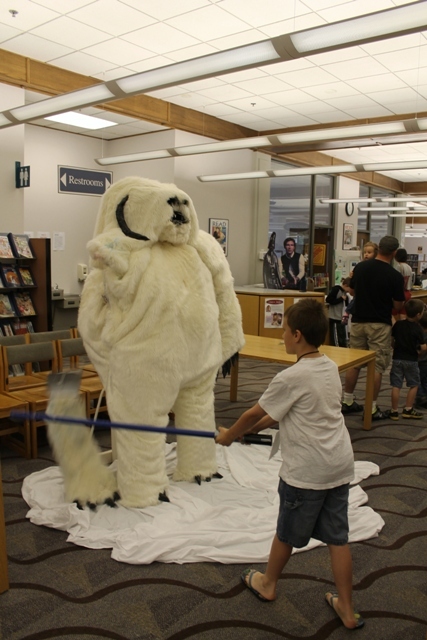 This would include a custom made Hoth wampa that kids could take turns hacking the arm off of with a lightsaber! 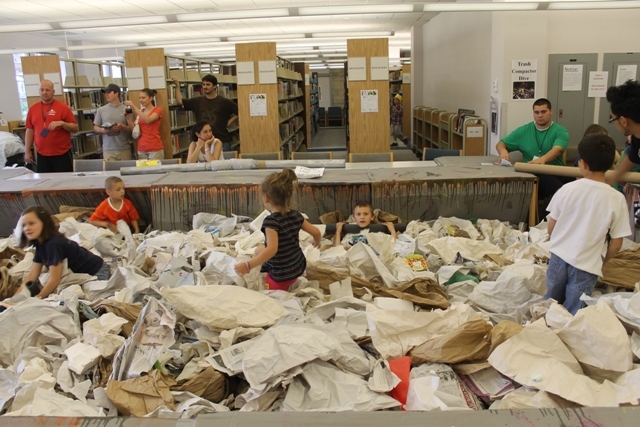 They also had a trash compactor for the kids to dive in and search for specified items! 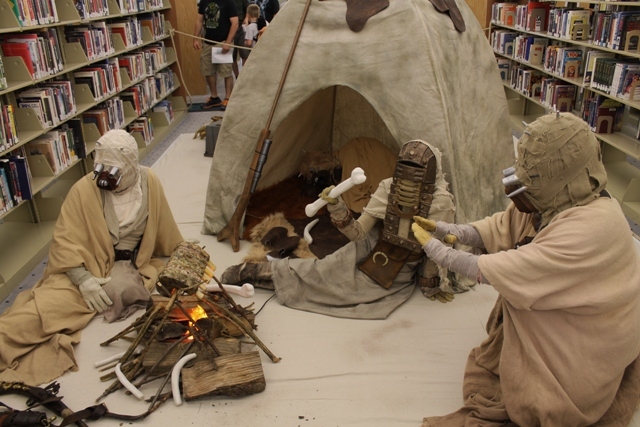 Throughout the library were also various scenes, including a family of sand people kicking back at a campfire. There were also some STAR WARS celebs on hand, most notably actress Orli Shoshan who played Jedi Master Shaak Ti in the New Trilogy. While autographs for her were $25 (or 3 for $50), you could get your picture taken with her for FREE! 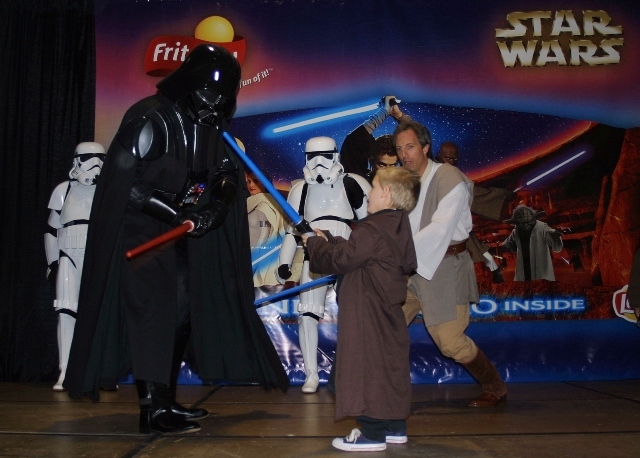 In fact, the entire event was free of charge which is something not often seen in the STAR WARS Universe! 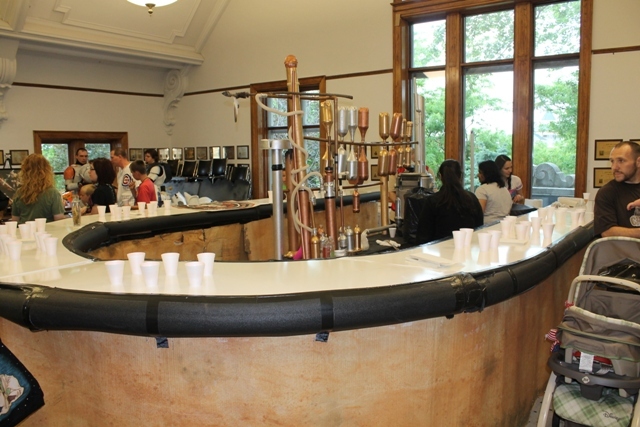 They were also offering free lemonade for fans to enjoy at their make-shift Cantina! 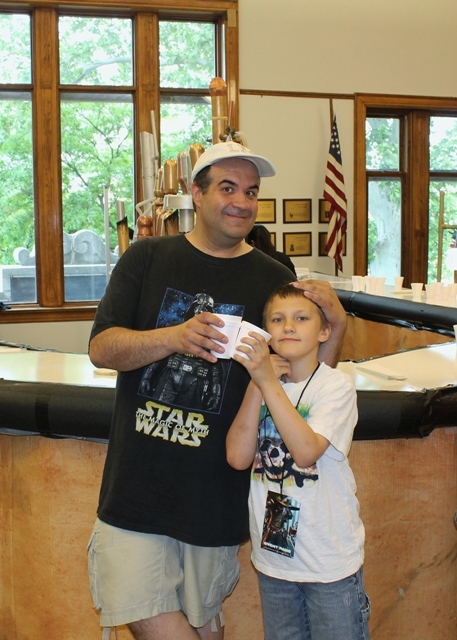 And so…after a full day of fun, it was time to kick back at the STAR WARS Cantina! This entry was posted in Science Fiction and tagged Bassk, Biker Scout, Boba Fett, Bounty Hunters, Boushh, Clone Troopers, Darth Maul, Darth Revan, Darth Vader, Dengar, George Lucas, Greedo, Hoth, Imperial Royal Guards, Jedi, LEGO, Luke Skywalker, Orli Shoshan, R2 D2, Ralph McQuarrie, Sand people, Shaak Ti, Sith, STAR WARS, STAR WARS CELEBRATION, Stormtroopers, The 501st Legion, Tusken Raider, Wampa. Bookmark the permalink. ← The Costumes of C2E2…Conclusion!